Because of the feedback received from its insider program, Microsoft has decided to launch an operating system specifically for professional users. It is a high-end edition of Windows 10 Pro with unique support for server grade PC hardware and designed to meet critical and intensive computing needs. 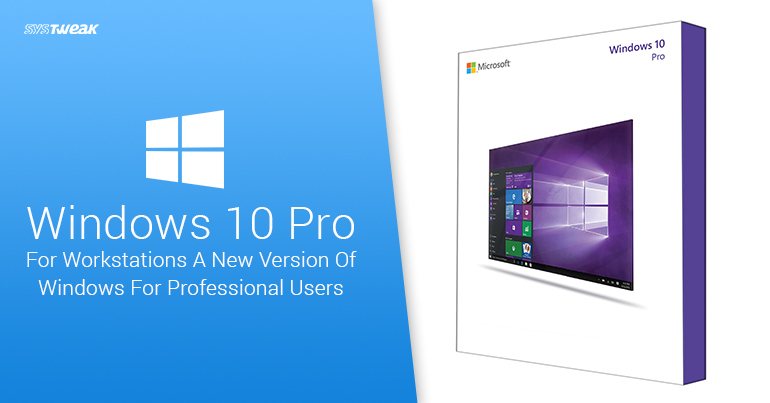 The value of Windows 10 Pro for Workstations is directly tuned to increase the performance and reliability of high-end PCs by including the following features. ReFS (Resilient file system): ReFS provides cloud-grade resiliency for data on fault-tolerant storage spaces and manages very large volumes easily. ReFS is designed to be resilient to data corruption, optimized for handling large data volumes, auto-correcting and more. It protects your data with integrity streams on your mirrored storage spaces. Using its integrity streams, ReFS detects when data becomes corrupt on one of the mirrored drives and uses a healthy copy of your data on the other drive to correct and protect your precious data. Persistent memory: Windows 10 Pro for Workstations provides the most demanding apps and data with the performance they require with non-volatile memory modules (NVDIMM-N) hardware. NVDIMM-N enables you to read and write your files with the fastest speed possible, the speed of the computer’s main memory. Because NVDIMM-N is non-volatile memory, your files will still be there, even when you switch your workstation off. Faster file sharing: Windows 10 Pro for Workstations includes a feature called SMB Direct, which supports the use of network adapters that have Remote Direct Memory Access (RDMA) capability. Network adapters that have RDMA can function at full speed with very low latency, while using very little CPU. Expanded hardware support: One of the top pain points expressed by Windows Insiders was the limits on taking advantage of the raw power of their machine. Hence, hardware support is expended in Windows 10 Pro for Workstations. Users will now be able to run Windows 10 Pro for Workstations on devices with high performance configurations including server grade Intel Xeon or AMD Opteron. processors, with up to 4 CPUs (Currently limited to 2 CPUs) and add massive memory up to 6TB (today limited to 2TB). With these features, we hope this new version of Windows will be able to match user standards and become as capable as Mac.